Looking for some Bluetooth headphones that can survive your workout routine? Then you might want to swing by Amazon's one-day special site, Gold Box. 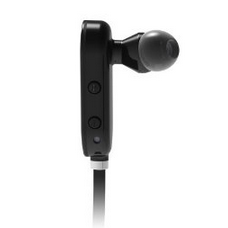 Today's deal is the Jaybird Freedom Bluetooth headphones for $39.99, over 40% off. In addition to A2DP stereo music support and voice calls, these guys have a lifetime warranty against sweat and are designed to stay secure during movement. This is the older design for Jaybird's Bluetooth buds, more recently replaced by the Freedom Sprint (which still retail for $100). In his 2011 review, Cameron Summerson said the Freedom headphones were great for listening to music, but their voice calling feature left a lot to be desired, with the other party complaining of poor sound (probably due to microphone placement). Still, for forty bucks you could do a lot worse for a semi-waterproof set of wireless headphones. The Freedom headphones come with three sets of silicone earbuds and three extra sets with grippy inserts, plus a carrying case. Music and call controls are included, and the headphones can be recharged via a standard microUSB port with no special cradle or cable. Amazon's Gold Box deals expire after one day, and they tend to sell out quickly, so get your order in fast if you want them. Prime customers get free shipping, as usual.